Some of you may think I have given up on blogging, or worse, given up on drinking. The truth is that I had given up on drinking -- but only temporarily. As many of you know, I had been planning my wedding for over a year, and that left no time to drink. I am now happily married and can resume imbibing. . . and blogging! But where to begin? I recently caught dinner with the wife and a few friends and the Vieux Carré jumped off of the cocktail list, so let's restart our adventure with this classic New Orleans cocktail! Add all of the ingredients to a shaker or to a Yarai mixing glass. Add ice. Stir for 30 seconds. 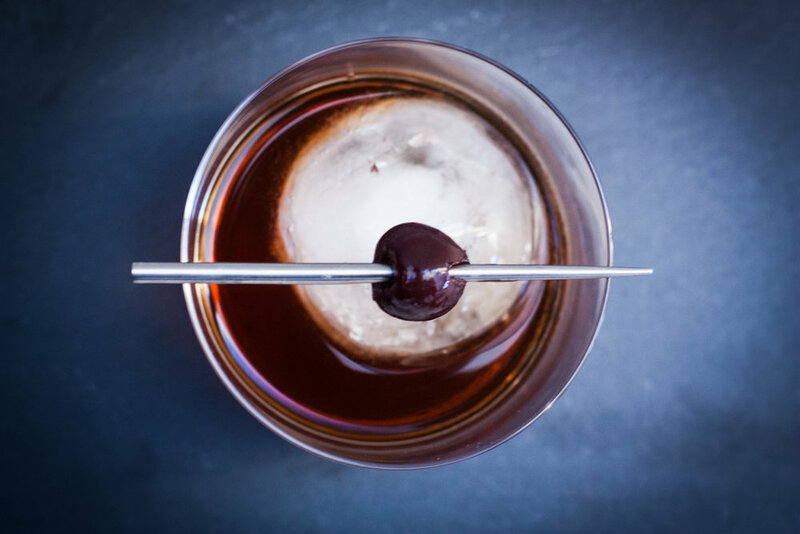 Strain into a lowball over a large ice cube and garnish with a brandied cherry. When the waiter brought me my Vieux Carré he said "here is your vu...vi...um, here is your cocktail." Later that night, after the buzz of just one cocktail wore off (seriously, what happened to my tolerance?! ), I thought about how people may not order certain drinks (or food, for that matter) because they don't know the correct pronunciation, and are afraid to look ignorant. It would be a shame to miss out some great drinks because of something silly like pronunciation. So how does one order a Vieux Carré ? From everything I have learned from people much smarter than I, the correct way to order this great classic drink is to ask for a VOO-ka-RAY. I definitely got it wrong at that restaurant, but at least I tried to say it and did not wussy out like the waiter! Alright, now you know how to order a Vieux Carré -- but what does it taste like? The best way I can describe a Vieux Carré is by saying that it is sort of a cross between a Manhattan and a Sazerac. It is definitely spirit forward (i.e., boozy). It has a spicy rye as part of the base, but is a tad sweeter because of the sweet vermouth (like a Manhattan), and has that anise note because of the Peychaud's (like a Sazerac). It is quite a complex overall as well, in part because of the barspoon of Bénédictine. If you like an herbal quality to the drink then increase the Bénédictine to 1/2 ounce and drop the other ingredients to 1/2 ounce as well. It's worth giving this a try to see how you like to take your Vieux Carré. Everyone has their favorite way to make certain cocktails, so experiment until you find how you like it. Named using the French term for what's now known as the French Quarter, the Vieux Carré is a classic drink worth adding to your repertoire. The next time you are in the mood for a dark spirited boozy cocktail, give the Vieux Carré a whirl. Enjoy!